Please find below a full report from the recent North East Regional Championships (NERS). We are very proud of our swimmers who qualified for these championships and had some fantastic results there! Well deserved for all their hard work and commitment to training. Looking forward to even more success at this level in 2019 from even more swimmers. From 15th Nov. 2018 we will be upgrading to ParentMail as Call Parents has been taken over by ParentMail. The benefits to this are that we now send Communications home through ParentMail but also have more applications to use, as well as a free, secure mobile App for you to pick up club communications on the go! Use a free, secure mobile app on Android and iOS to pick up club messages instantly. Update your contact details within the secure mobile app. Once registered, if you have an Android or Apple smartphone, we would highly recommend you download the ParentMail App for the best user experience. To do this, simply search for “ParentMail” in your App store. Morpeth ASC belongs to something called the Northumberland Hub as part of the regional swimming set up and Northumberland and Durham Performance programme. Within this Hub are Alnwick, Ashington, Blyth, Morpeth and Tynedale. Entry to the Hub is based upon a selection criteria decided by the Hub itself and once a swimmer reaches this criterion they are invited to attend. We are fortunate in our Hub of having smaller clubs and therefore our entry criteria is attainment of an “Northumberland & Durham (N &D) ” time in that year. For some Hubs it is reaching the finals of the North East Regional Event! The benefits of the Hub include access to the only 50m pool in our area, Sunderland. The chance to train with other swimmers at a similar level, experience different coaching styles, use the most up to date training equipment. This season we will hopefully get use of the underwater video system at Sunderland pool. The swimmers individually pay a small fee for the Hub session but the rest of the pool hire cost comes from Swim England so crucially none of the cost is met by Morpeth ASC fees. Poolside you will see swimmers wearing Hub swim hats mainly in the Performance squad, the purpose of this note is just to explain what this is and that it is something that ALL our swimmers can aspire to and attend (subject to them reaching the selection criteria). Swimmers from the Hub can progress through the Swim England system to a more select 'talent' camps where we were lucky enough to have three of our swimmers attend swim camps this year. The hub is also directly linked to the Northumberland and Durham Performance Programme for the county's top swimmers. 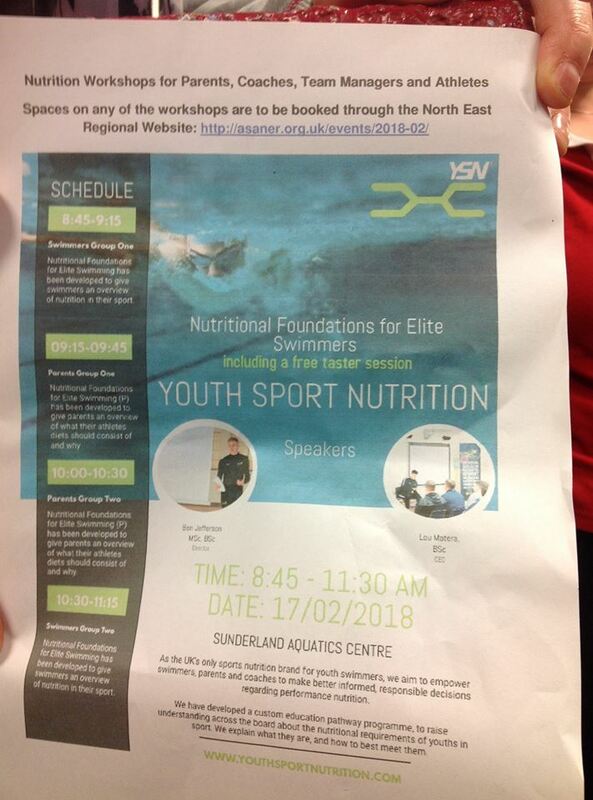 Only 2 swimmers from Northumberland have been selected for this programme this season, 1 of these swimmers is in Morpeth ASC Performance squad. Our Morpeth ASC representatives on the Hub are David Tate and Terry Hewitt so if you have any questions please ask them. Becki will be taking the lead coach roles at these sessions this season as well. As parents you don't need to analyse your child's swimming, that is the job of the coaching team! One way you can really help and support them to perform well though is encouraging good eating and drinking habits at competitions. Swimming competitions are long days and a lot of young swimmers tend to overeat early on and then not eat or drink anywhere near enough towards the end of the day. Below are a few documents with snack ideas and information on when to eat at competitions (for example swimmers should be snacking and drinking straight after each race on their way to swim down). Our young swimmers don't need to be following any fancy nutrition plan just yet! Equally they don't need to be finishing off a family sized bag of chocolate buttons or Haribos before 9:15am or eating a large Pasta bowl 7 minutes before their 400 Free heat gets on the blocks. Please provide swimmers with all their snacks and drinks for each session at competitions. New sessions: Just a reminder we start our new training times and squads from next (Monday 1st October). The new programme puts the club and our swimmers in a strong position to begin fulfilling their true potential. Morning sessions: I have had confirmation from the pool that we will be able to get in the building no later than 5:50am so hopefully no standing in the cold over winter! Below is an article about how best to support your child with early morning training. While slightly earlier mornings is a change for Morpeth ASC it is the norm in all successful swimming clubs, it is part of any successful swimmers (and their parents) routine. Most clubs would love 6am starts! Breakfast: Also attached are some ideas for Breakfast to help set swimmers up for a good training session and day at school. One of MASC swimmers : Libby Freeman was competing in the Swim England National County Team Championships yesterday (Sunday 07/10/2018) for the Northumberland & Durham team! Libby competed in the girls 12/13years 100m backstroke and 12/13 years 200m Medley Relay. Swimmers at this event compete as a team against other counties for points (Diddy League on a larger scale). Libby came away with two personal best times in her two swims. She gained valuable experience travelling and staying over with the Northumberland and Durham team. The Northumberland & Durham team came 8th overall. From Friday 7th September 2018 the cafe will be open at Morpeth pool for the club to use on a Friday evening. The cafe will be open until 8pm with food served until 7:30pm. The cafe is located upstairs and there is a door which will be open directly from the balcony area. We are aware a lot of swimmers, parents, grandparents and younger siblings spend a lot of time on the balcony and at the pool. We want to encourage as many members as possible to use the cafe for food, snacks and drinks while at the pool. The cafe will be open every Friday throughout September as part of a trial. If the trial is successful there may be the possibility of the cafe opening at other times convenient for the club and our members. 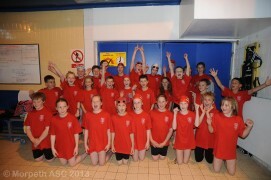 Congratulations Morpeth ASC Junior League Team! Another fantastic performance finishing 2nd in our first ever Division 2 final! Well done to everyone who took part in this years Junior League, heats and final. Looking forward to seeing what next years team can do. While everyone else has been lying on the beach this summer the MASC team have been working hard on planning the new season! There are some exciting changes ahead but the biggest news is that we have been able to secure Becki on a full time basis here at MASC. After many years at Tynemouth she took the difficult decision to leave them this season and concentrate solely on MASC. Becki will now be speaking to coaches and the committee to see what the 'new look' season will entail. As soon as we have all the details we will be having presentations and Q&A sessions for each squad during September so all members are clear on any changes before anything is implemented (plan would be to start changes in October). It is going to be an exciting new season at MASC so please join me in welcoming Becki on board. As soon as we have any more details we will share them with all. A big well done to all our swimmers who competed today at the joint gala with Making Waves. We had a fantastic afternoon of racing with almost 90 swimmers aged 5-12 taking part. They were all fantastic in and out the pool. A huge thank you to everyone who volunteered to help out today, with all the jobs that needed doing. We wouldn’t have been able to put on such a well ran event without your efforts (I can’t thank you enough!). Thank you to Morpeth Riverside Centre for helping us out with setting up and the logistics of accommodating everyone! Remember to keep an eye on the notice board, website and emails for details of future competitions. On 23rd May 2018, Morpeth Sports Council held their Annual Sports Awards. Congratulations to everyone involved and thank you to Morpeth Sports Council for putting on the awards. Click here for a full report from our recent success at the 2018 N&D Championships attached. Congratulations again to everyone involved. Well done to Kate Kennedy and Ben Hewitt who have been invited to be part of the N&D Swim England Talent program in 2018 following their strong performances. More good news for Morpeth ASC! Morpeth ASC Junior League Team have been nominated for the Dalton Hutchinson Trophy (Under 13 Team Award) at the Morpeth Sports Awards! This is for the team performances over the last 12 months including winning Division 3 last season (and 5/6 available trophies), gaining promotion to Division 2 and recently winning our first event in Division 2! We only have 5 tickets available for the presentation evening at the moment (but are seeking more). The presentation will take place on Wednesday 23rd May 2018 at 7:30pm (Morpeth Rugby Club). Can I ask you send your child's name to coach@morpeth-asc.org.uk if they wish to be entered into the random name draw to decide who is going to go on behalf of the team. Congratulations to Kate Kennedy who has been nominated for an individual award as well for her recent performance over the last 12 months! For details of this year's MASC Annual General Meeting please read the document below. Any questions, please send them directly to Jennie Belton . The clubs AGM will take place in April when volunteers are elected to join the committee. Jennie B (Club Secretary) will send out official details in due course but I thought it was worth asking people now to think about volunteering and giving up some time to help run the club. Before 'signing up' at the AGM now is the time to ask questions of me, or any of the current committee if you want to know more or are considering volunteering. Below is a brief summary of the roles available, some of which will be done at the AGM, some of which can happen at any point (Competition officials). Please take some time to read through it and ask any questions you may have. I just wanted to thank everyone who took part in any of the club activities last weekend. On Saturday we entered 17 teams at the County Team Championships, 13 of which got to the finals. At the same time, back at Morpeth we had three teams of swimmers, parents, coaches, siblings and friends taking part in the fun event organised by the Lions - well done for all those who turned up and did MASC proud - setting the bar high for all the other teams. The weekend then finished off with our younger swimmers doing brilliantly in the Diddy League event. It is our first year in Division 2 and we managed to put in a great team performance to come first in this round. I can't remember such a busy and exciting weekend for the club, thanks to everyone who played a part. For anyone who is collecting sponsorship (or if anyone would like to donate) to the Lions Swim if they could please send the payment to MASC via normal payment methods (electronic payment or the letterbox on the back of the door) as long as they are clearly marked 'Lions Swim' we will collate all the money and forward onto the Lions in one payment. Thanks again, I hope you enjoyed it as much as I did. Every year the Lions organise a fundraising sponsored swim at the Leisure Centre. This year MASC has three lanes available from 1pm until 2pm where we can have three teams trying to swim as many lengths as possible. Any ages, any squads, Parents and/or coaches can take part. If anyone is willing and able to join one of the teams could you please let me know ASAP. It takes place Saturday 10th March - apologies for the short notice, please email me if you can take part, either in the pool or as a volunteer 'Team Captain'. Club annual membership renewals are here again. This is for every member of Morpeth Amateur Swimming Club. Category 1 £17.00 - Non-competitive swimmers. Minnow and Skill Development squads. 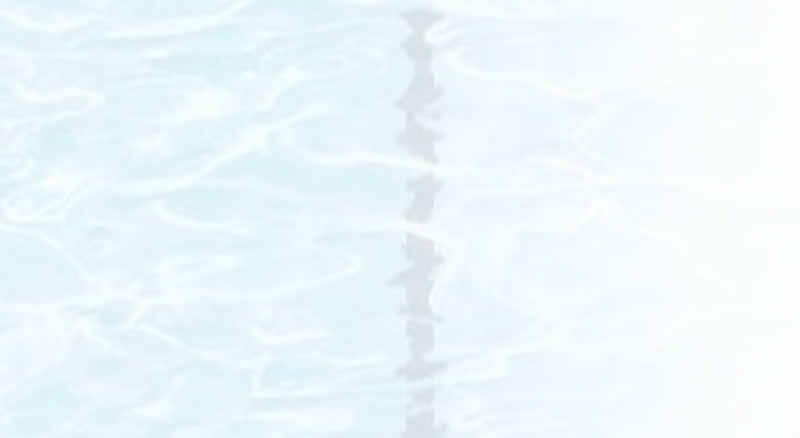 Normally swimmers can not compete in galas until they are 9, however there are a few invitational galas for 8 and overs, who can enter without upgrading their membership to Category 2. Category 2 £34.00 - Competitive swimmers. Note to Seniors – Which category you swim in will be your decision. If you are unsure which category your child should be in please ask. This year there will be no forms to be completed unless your personal information has changed. Membership runs 1 January – 31 December. We are requesting a deadline for every swimmer 4th February this will give everyone just over 3 weeks to confirm their Category and make payment. By BANK TRANSFER online or by BANK DEPOSIT at the bank into the MASC Barclays account. The Morpeth ASC committee has decided to change the way parents are asked to pay for their swimmer’s Gala entry and to use a system of payment at the time of entry, which is common for most clubs. parents often didn’t know whether and when to pay for a gala entry and we were frequently waiting - often for many weeks - to hear of rejections. This has not been ideal as payments came trickling in at random and reminder emails were often required. This also meant, that the club had to pay the Gala host long before recouping the cost from the entrants. Please pay for your swimmer’s entry at the time of online registration. Lynda Garland, our gala secretary, may also insert a payment prompt into the registration system. There will be several days for payments to be made before the Gala host's deadline. Payments are best made by BACS. Alternatively, you may put cash or a cheque into the poolside payments box, but in this case, please drop me a quick email to let me know you’ve paid. As a parent you can then forget about the entry formalities and look forward to the gala. Like most well run clubs, MASC has updated it’s banking capabilities and - in the case of rejections - neither a credit system nor refunds to parents are now a problem. If you are in credit, I will email you and remind you of that option. Refunds: If you prefer a refund, this can also be done. I would just ask you for your bank details so I can BACS you promptly. Cheque refunds are time consuming and only available in exceptions. As always, if you have questions or comments, don’t hesitate to email Andreas (Treasurer) . Just a quick reminder for those notified about squad movement that this effective from Monday 19th February 2018. Please see the information Kay has received below.